1) 16-01-2015 Anusham : Parayanam on Rig, Krishna Yajur, Sukla Yajur, Kouthuma & Jaimini Sakhas of Sama Vedam was performed by 10 Veda Vidwangal. 2) 25-01-2015 Sukla Shashti : Parayanam on Rig, Krishna Yajur, Sukla Yajur, Kouthuma & Jaimini Sakhas of Sama Vedam was performed by 10 Veda Vidwangal. 3) 28-01-2015 Krithigai Rig Veda Parayanam was commenced on 28-01-2015-Thai Krithigai. Six Veda Vidwangal Participated. 4 ) Rig Veda Nithya Parayanam is being held regularly. With the blessings of the Acharyas of Kanchi, It is under proposal to organize Veda Parayanam at Swamimalai under this forum “Swamimalai Veda Parayanam” during the forth-coming KumbhaBhishekam of Sri Swaminathaswamy Temple at Swamimalai. Devotees are invited to participate. The eternal and sacred Vedas are the very basis or root of our Sanathana Dharma. Vedas are the sustaining divine force of the universe bestowing all round prosperity to the entire humanity. 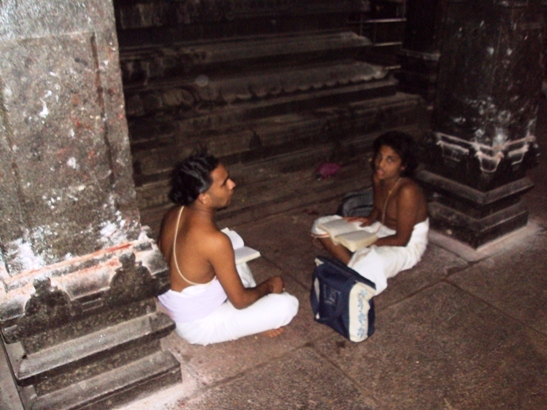 Vedic Studies, rendering Veda Parayanam and Veda Parayana Sravanam (i.e. attending Veda Parayanam), all these are the most effective means towards universal prosperity, one’s emancipation endowing ‘Parama Sreyas’. His Holiness Jagadguru Sankaracharya Sri Chandrasekharendra Saraswathi Swamigal, the 68th Peetadhipathi of Kanchi Kamakoti Peetam had taken upon Himself, with missionary zeal, the task of working for the preservation of Vedic tradition, culture, practice, and propagation of this vast Vedic treasure, in its pristine pure form, handed down to our generation by our scholarly ancestors. We are all indebted to the Sage of Kanchi, our Paramaacharya, as HH is popularly referred to, that but for His Holiness’s forethought, instinct and unstinted efforts, some of the rare sakhas like ‘Atharvana Sounaka’ would have been lost for ever. With this background, Their Holiness Jagadguru Sri Jayendra Saraswathi Swamigal and Jagadguru Sri Sankara Vijayendra Sarawathi Swamiagl, the 69th & 70th Peetadhipathees of Kanchi Kamakoti Peetam directed that Nithya Veda Parayanam be organized at Swamimalai Sri SwaminathaSwamy Temple. 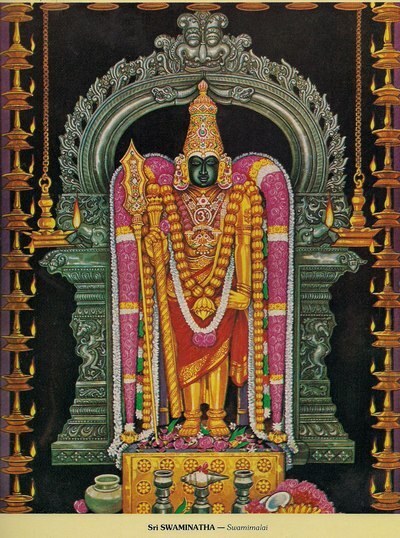 This apt selection of venue is significant that the “Poorvaasrama Kuladaivam” of HH MahaPeriava Sri Chandrasekharendra Sarawathi Swamigal is Swamimalai Sri SwaminathaSwamy; besides, Swamimalai is one of the six sacred Subramanya Kshetrams where the Divine Son Subramanya, assumed the name of Swaminathaswami and initiated “Pranavopadesam’ to Father Lord Siva. Swamimalai Veda Parayanam was Inaugurated on 13-09-2010 by 6 Veda Vidvangal drawn 2 each from Rig, Krishna Yajur & Gouthama Sama Vedam; followed by Parayanam on every Anusham. Thittireeya Upanishad Parayanam is arranged on every Aradhanai day of HH Sri Maha Periava, starting from the year Vikruthi 01-01-2011. From 24-03-2011 Anusham, the content of the parayanam was enhanced to include the Sukla Yajur Vedam and the rare Jaimini Sakhai of Sama Vedam. Thus now 10 Vedic Scholars, 2 each from Rig, Krishna Yajur, Sukla Yajur, Gouthama & Jaimini Sakhas of Sama Vedam participate in the Parayanam. (including Atharvana Vedam are accommodated. However Atharvana Veda Vidvangal have to be drafted from out-stations. So, In our efforts to bring Atharvana Vedam also into the perview of ‘Swamimalai Veda Parayanam’, an annual program was arranged. During 6th to 8th Aug 2011, ending with Anusham on 8th Aug 2011, ATHARVANA VEDA SAMHITHA POORNA PARAYANAM was rendered by 4 South Indian Atharvana Veda Pundits. It was an unique programme in the sense that the 4 Pundits were “Dwi-Vedies” i.e. besides their own Veda Sakhai, have additionally completed Vedaabyasam of Atharvana Sounaka Sakhai. Two of these scholars are the ones whom during mid-1960s HH Sri Maha Periava sponsored to undergo Atharva Veda Paatam for 5 years under an eminent scholar at Gujarat. From the year 2012 onwards, this is conducted for 4 days at a stretch. For further reading, an article titled “Atharvana Vedam - HH’s initiative” is presented separately. Jaimini Sama Veda Vidwangal are drafted for parayanam from Thohur near Trichy and Athrvana Veda Vidwangal from Thirupathy and Chennai. The scope of the parayanam was extended to Sukla Shashti also from Nandana Year 2012-2013. 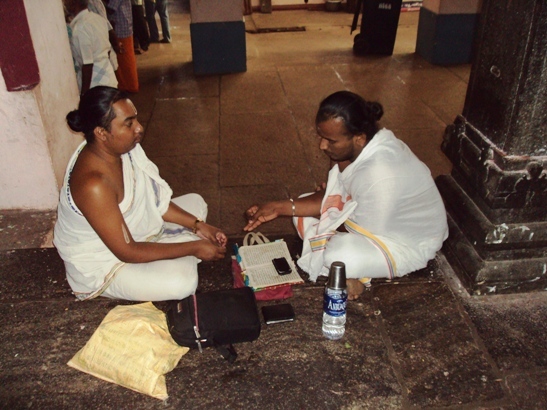 Now 27/04/2012 onwards, Parayanam is being held on every Sukla Shashti also besides Anusham. Their Holiness have further directed that this Parayanam, presently conducted on every Anusham & Sukla Shashti be gradually extended to be held “DAILY” (Nithya Parayanam) on all Vedas. Accordingly we were graced to start Rig Veda Nithya Parayanam from 21-09-2012 synchronizing with Anusham & Sukla Shashti. 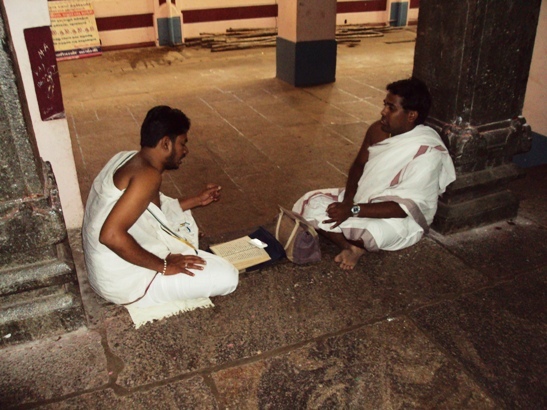 It is customary that the “Vyasa Poojai Vasthram” from Sri Kanchi Kamakoti Peetam is offered to Swamimalai Sri Swaminathaswamy every year during Chaathurmasya Vratham. In line with this tradition, as directed by their Holiness, on the concluding day of Atharva Veda Parayanam 8-8-2011 Anusham, Ushath Kala Abhishekam was performed to the Lord; Sri Rudram, Pancha Rudram, Sama Veda Rudram, Atharvana Veda Rudram, Kumaara Sooktham followed by chamakam, Purusha Sooktham & Nakshatra Sooktham etc were all rendered by Veda Parayana Pundits. 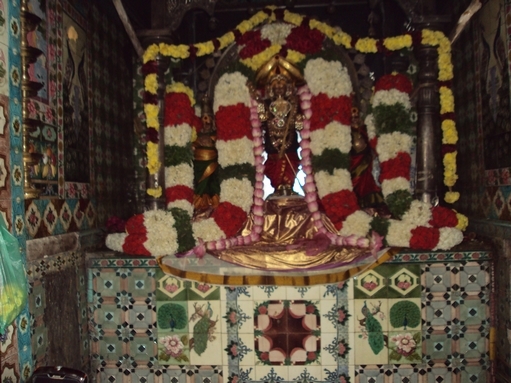 Sri Swaminathaswami was adorned with the “Vyasa Poojai Vastram”. The entire event was an enthralling divine scenario. “Kumaara Bhojanam” was arranged as a part of Vasthra Samarpanam programme. 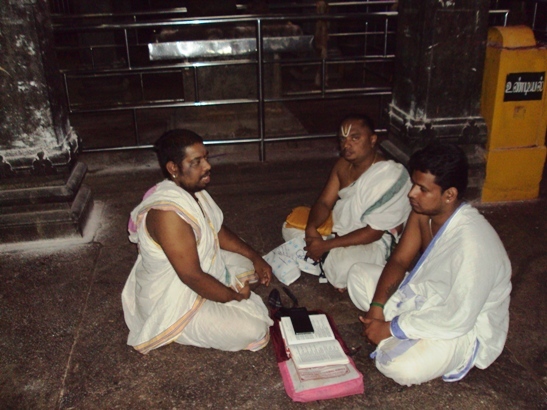 In the evening, regular Anusha Parayanam was performed by 14 Vedic Scholars including Atharva Veda Vidvans. From Vijaya Year (2013-2014) onwards, Rig Veda Sookthangal Parayanam is arranged on every Jayanthi of HH Sri Maha Periava. For the first 2 years 2011 & 2012, Atharvana Veda Poorna Samhitha Parayanam was held once during a year. Their Holiness directed that this will be twice a year from 2013 onwards. The 1st session was during 11th to 14th Sep 2013, and the 2nd session from 5th to 8th Nov 2013 coinciding with Skanda Shashti on 8th Nov 2013.